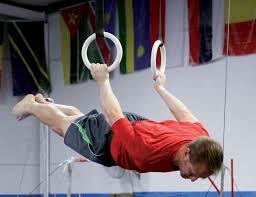 Rising Star’s Adult Class is open to anyone 17 and over who wants to participate in gymnastics! Ex-gymnasts, crossfitters, martial artists or adults brand new the sport are welcomed to join! Free-runners, trickers & “Ninja Warriors” are welcomed too! The class is a combination of structured class as well as free time for you to work on the skills of your choice. Tuesdays &/or Thursdays from 7:30-8:30 p.m.